D.S. – Dal Segno – Now On Sale! Happiness. Paradise. Words that mean as many different things as there are people in this earth. What does happiness mean to you? What shape does your paradise take? From Circus, the creators of the world-renowned series ​Da Capo​, comes a brand new tale on a summer is—Dal Segno! D.S. 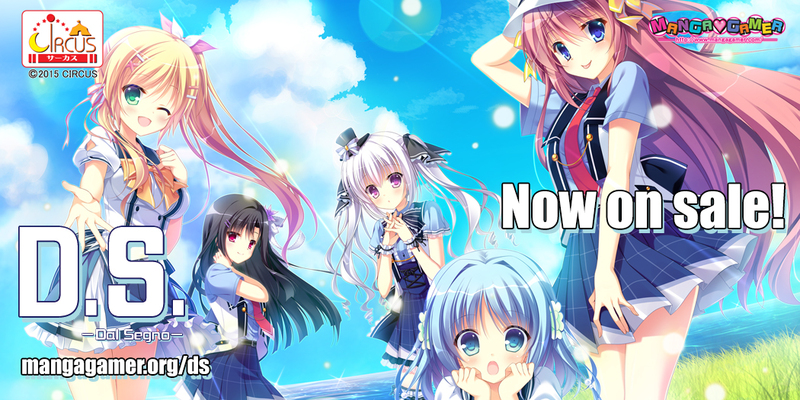 Dal Segno is now available from MangaGamer.com and will be available on Steam later today! As we mentioned when the game went up for pre-order, in accordance with our new policy, you’ll be able to download a free patch for the Steam version to “upgrade” the game to the include adult content right here! UPD. You deveiced me. Please, don’t write that it’s TRIAL, because I was really expecting to download and play trial version, but it’s patch… U-ugh… Very strange thing, especially, if page on the product site says that you have trial version. Apologies! Our website’s been misbehaving a bit so the patch is currently mislabeled as a demo. We’re working on fixing that to avoid further confusion. Normally I wouldn’t purchase a title I’m not too interested in, but due to your free Steam patch policy, I’ve opted to purchase your first one based on that positive customer experience alone. As someone who really likes having all their games in one place, being able to purchase on Steam and know I will get the full experience is a massive boon.